ECONetwork is a new electricity network described as “Autonomic Dispersed”, “Local Generation/ Local Consumption”, which can co-exist with a GRID or can be independent from that GRID. The main characteristic is to make the massive deployment of Renewable Energy Sources available by eliminating the reverse tide flow to GRID. ECONetwork is not a single big network. 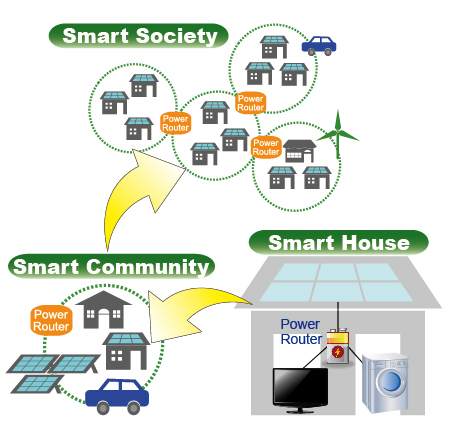 It is a network of small but standardized clusters, composed of around 30 households or equivalent. A cluster is a combination of a generator and/or a storage, and an appliance with power router. Those clusters accommodate excess & shortfall of electricity, and achieve a total balance of electricity supply.